Vivid Viewpoint pens add a splash of color to the calligrapher's everyday writing experience. Whether writing out bridal invitations, place cards, award certificates, school art projects, handwriting notes, or holiday cards, Sheaffer Calligraphy offers long lasting value and quality. A rubberized grip with traction dimples promotes a secure grip of the pen, enabling more stability while guiding the nib across paper. The snap-fit cap can be removed with one hand, keeping the other hand free for project control. A visible ink supply conveniently lets the calligrapher know when the ink cartridge should be replaced, and can be reused for continued writing enjoyment. Sheaffer Calligraphy Viewpoint pens feature the "White Dot" symbol of quality and prestige. Sheaffer Calligraphy is ideal for anyone; from entry level to more experienced users who are looking for ease, comfort, and the ability to express oneself in color. 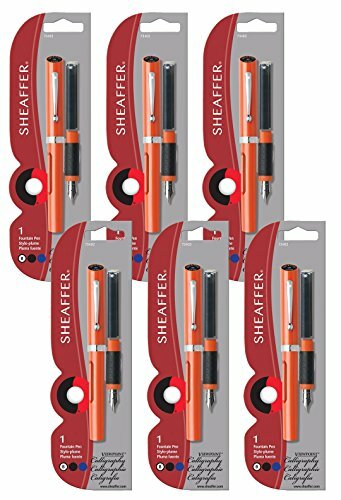 Sheaffer offers an assortment of Sheaffer Skrip ink cartridges for added creativity and options. If you have any questions about this product by SHEAFFER, contact us by completing and submitting the form below. If you are looking for a specif part number, please include it with your message.